my brother sent me this video the other day. [as his big sister, i’d like to take some credit for helping him develop good taste in music 😉 ]. i love the cute love stories, yes i do. this blog is a bit like a daily dose of chicken soup for the soul. not sure if it would actually be something found in a “chicken soup” book since i never read those, but the blog’s emotion-filled posts remind me why i so appreciate music and literature and art. Josh and I saw Stardust a couple weeks ago, and I thoroughly enjoyed this self-aware and yet completely cheesy fairy tale. Probably even more so as a wonderful escape from my call-every-fourth-night, one-day-off-a-week NICU schedule. Until a friend recommended it, I’d heard nothing about this latest entry into the fantasy genre made popular again by the Harry Potter and LOTR movies. 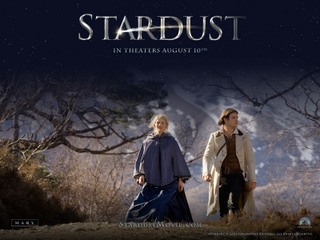 Stardust is based on a novel by Neil Gaiman, better known for his dark Sandman comics. I have not read of any Gaiman myself, having only heard of him from my geek friends (not to say that I am any less of a geek). After my friend recommended it, and I figured out that it was not in any way related to Las Vegas (is that hotel still around? ), I went to my trusty movie guide – the all-knowing “Rotten Tomatoes“, which I use to screen out movies that will waste my precious free time. A fairy tale and a fresh rating? Sure, why not. With its playfully self-aware humor, Stardust has drawn many comparisons (some unfavorable) to The Princess Bride. I’m not one of those who has adoringly memorized Princess Bride, and admittedly have only a vague memory of the movie (I was only 6 when it came out! ), so I can’t make those comparisons. All I know is that I enjoyed Stardust‘s well-paced and charming story of princes, witches, pirates, and above all, love. 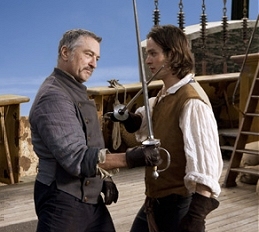 Of course, it doesn’t hurt that Charlie Cox is easy on the eyes, though it’s Robert De Niro who steals the scenes. Per the LA Times review, “with its heart worn proudly on its sleeve, it’s one of the best date movies of the year, a compatibility litmus test for starry-eyed romantics.” So if you’re looking for a fun movie with a story that’s captivating but simple enough to be kind to your brain, I highly recommend you catch Stardust before it’s out of the theaters. I’m already looking forward to having time to read the book. so i am writing this after having slept from 4 pm to 10 pm. yes, i am post-call and got one hr of sleep last night. i came home to find a giant pink postcard from josh that couldn’t have had better timing. if you hadn’t already guessed it, i am a huge sap (see: favorite songs, movies, books, etc.) and have been a fan of the “Love Is…” comics since i was bored enough to read the LA Times cover to cover (summers during grade school), and discovered the “Love Is…” comics along with the word jumble hidden in the classified ads section. i used to cut out the ones i thought were particularly cute or might be applicable in the future, as i had no boyfriends or even potential ones at that point. and yes, i have a collection of these newspaper clippings somewhere, in addition to some books that josh has bought me for various occasions, and a screen printed tank top that my sister bought me. if you know me, you know what a sap i am. and you know of my fondness for chick flicks and Jane Austen.